A lot of the press surrounding OPSkins hasn't exactly been positive recently. The skin-trading site has found itself at odds with Valve, with the firm blocking trading bots designed to get around a seven-day trading hold that the Steam giant placed on items on its marketplace. This has resulted in an estimated $3m worth of digital assets being lost after the firm blocked the trading bots that OPSkins had been using. Well, that's what we've heard - but OPSkins CIO Malcolm CasSelle claims that its consumers just "abandoned" these items. "These items weren’t lost or destroyed. The players simply abandoned them," he says. "They just didn’t care about them anymore. Players had weeks to claim their items but didn’t. Most CSGO players chose to leave their skins on OPSkins bots and walk away. 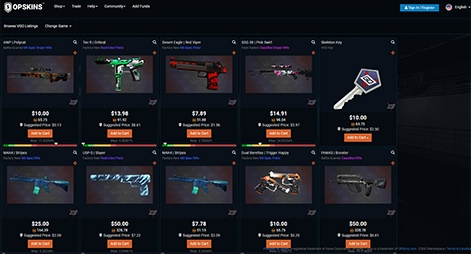 This behaviour highlights the fact the value of the skins were tightly associated with the variety of important services that OPSkins provides. Once Valve took away the freedom of players to trade on OPSkins, the perceived value of those items greatly diminished. And it’s not like people didn’t have the opportunity to collect their skins if they wished to." CasSelle believes that Valve moving to block OPSkins trading bots - ones that it claims were open-sourced and built over three years ago - comes from a place of greed. "Based on Valve’s public and private statements, as well as its behaviour, we firmly believe Valve’s primary motivation in removing OPSkins from Steam was to force people to use Steam Community Market," he says. "It has a right to do that of course. It’s their platform. But forcing your customers to use an inferior service just because you want to extract more profit out of them is not a good long-term strategy. Especially when customers have new and better choices. "Valve initially said its arbitrary CS:GO seven-day trade hold was necessary to combat fraud. We took them at their word, at the time, and quickly developed a better way to retain instant trading capabilities without fraud risk. That better way was with through our latest product development - WAX ExpressTrade. Problem solved. The community loved it. But then Valve showed their true motivation behind the seven-day trade hold. They wanted to capture a larger share of the secondary trading market. Valve’s ‘we want to reduce the fraud’ narrative’ was immediately exposed as a red herring. Valve simply didn’t want to have OPSkins operating a better trading system than they are capable of doing. "The vast majority of CS:GO trading customers preferred to use OPSkins when given a choice. But once Valve imposed the seven-day trade hold and then banned OPSkins from servicing the CS:GO community, they were back on the top. Back on top of a vastly smaller market, however, since many CS:GO item traders left the market once OPSkins was no longer available." According to CasSelle, any dialogue between the two companies has broken down since OPSkins announced its new blockchain protocol. "Valve corresponded with us when we first showcased WAX ExpressTrade and partnered with a new concept in virtual items called VGO," he claims. "VGO is the first of its kind blockchain hybrid digital item. Valve did not like it. So the company asked us to not go forward with our plans. I suppose they were threatened by what we were releasing to the global item trading community. But we never hesitated. For over two years we had been working on something vastly better than Steam for the global item trading community. That something is the WAX global gaming platform. The most ambitious project in our company’s history. Last year we raised over $150 million to launch the WAX platform. It is a platform like no other for the video gaming world. WAX is the world’s first global video gaming platform that is virtual-item-centric. Not publisher-centric. WAX represents a massive shift in how the video game industry is structured." That WAX you keep hearing about is World Asset Exchange, a new blockchain-powered asset trading site that CasSelle insists is a much better system than even OPSkins. "The thinking behind WAX comes from a very simple proposition," he says. "We felt the future was blockchain, peer-to-peer trading. It's much more powerful than centralised trading. There 1,000 more things you can do with it. Plus, if you're a streamer and have peer-to-peer trading available to you, it means that you can make money trading from your audience. Currently, you're only making money from advertising. 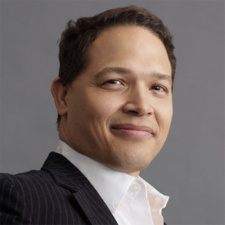 It's a superior business model for content creators in the gaming space." WAX's launch also comes at a time where - according to CasSelle - developers are more and more interested in getting blockchain and item-trading into their games. "Most game developers haven't embraced item trading that very heavily," he says. "All these indie developers that are looking at item trading are embracing it. That's why what we're seeing is this watershed moment where item trading will become pervasive." He continues: "The main reason you don't see item trading is that it's really hard to create a great game. Once you've gone to that level to create a great game, you're producing new levels, customer support, distribution partners, keeping the game relevant. You have so much to do. The idea of embracing another business model which you know nothing about and is very complicated and has lots of inherent risks - secondary markets can do lots of things that hurt games if they're not designed properly - is scary. Items that are functional as opposed to cosmetic - like we saw with Star Wars Battlefront - can be a huge mess. This business model requires a certain amount of experience, knowledge and developer time. When you look at the list of things that the average has to worry about to keep a successful game franchise, they just never get to it." If you're wondering whether WAX sounds like a competitor to OPSkins then you'd be right - CasSelle says that this is intentional, too. "We have designed with WAX to compete with OPSkins. We're disrupting ourselves," he says. "We have leapfrogged the innovative dilemma. OPSkins, running as a business, had an asteroid in deep space with blockchain written on the side of it - that was the existential threat. We have a great centralised business, so what's the threat - a big decentralised business doing the same thing. A decentralised datacentre will always be way more efficient than a centralised one because it can go where the power is cheapest. What I see happening is that as WAX becomes very successful, OPSkins will not be the biggest single marketplace in the world - it'll be one of thousands of successful marketplaces. "OPSkins is 10 or 20 times bigger than our nearest competititor - but to give away all the power of OPSkins to thousands of people means there's going to be many, many more marketplaces. They will be very large. We're looking to WAX to empower thousands of competitors. Right now they couldn't go spend the money that we spent to build OPSkins. We're going to be giving them WAX for free."